Welcome to ABFriday’s monthly One Photo Focus! 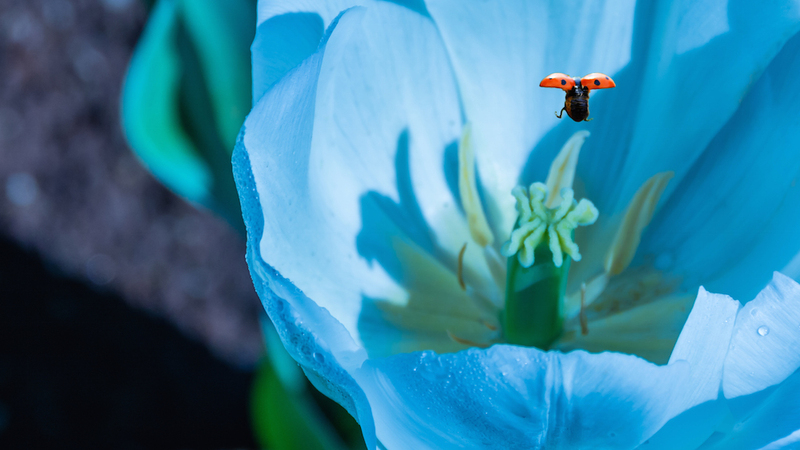 This month, two dozen photographers are sharing their post-processing interpretations of one “before” image submitted by Julie Powell of Julie Powell Photography. 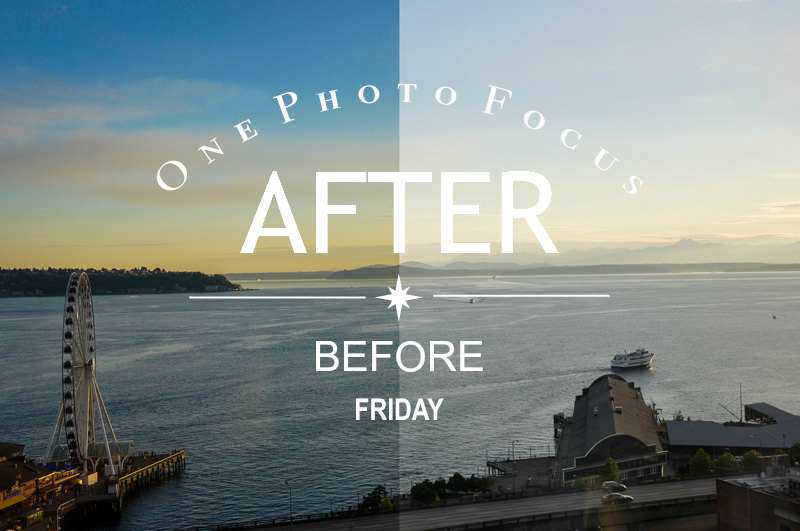 We begin with Julie’s “before” image, followed by the “afters,” and at the end, a gallery of all so you can watch the changes as you scroll through. 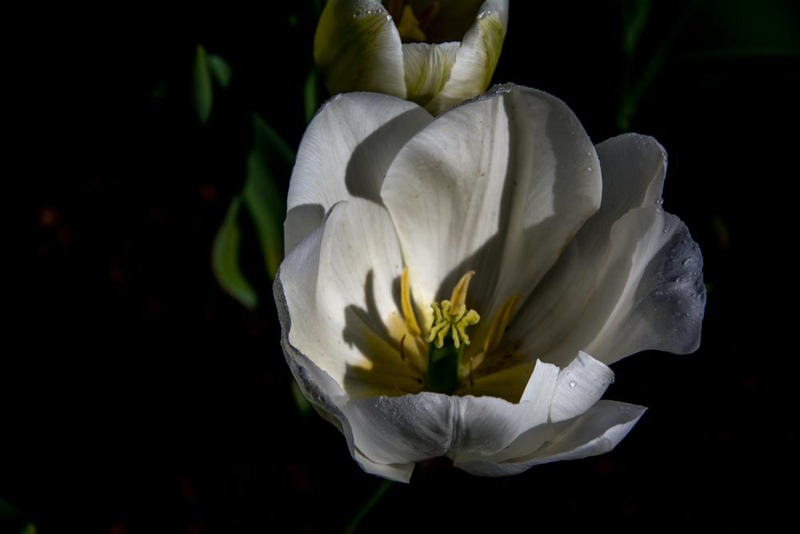 Be sure to click the links to each participant’s blog as many have written posts “uncovering the magic” behind their “after” images. And if you would like to participate in January’s One Photo Focus (our one-year anniversary post! ), you’ll find all the details on the After-Before Friday Forum page. So, I decided Julie’s image was the perfect one to try my hand at Photoshop layers, and as you can see, I had a blast! I started with a textured background layer. 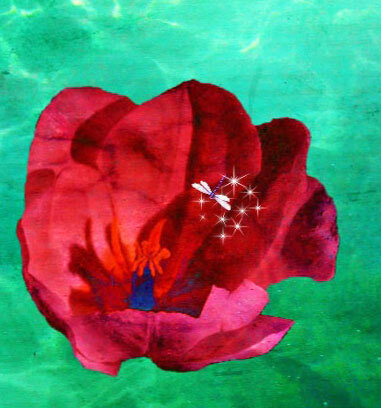 From there, I selected the rose using the quick selection tool, copied it, and pasted it onto the background twice, enlarging it and rotating it a bit each time. 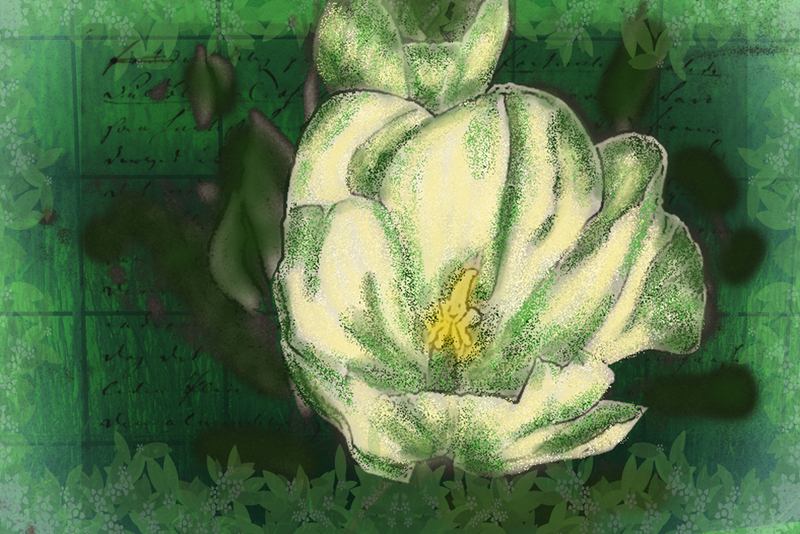 Then I added an image I took of a fern and somehow managed to figure out how to erase the portion of the fern covering the rose so it would show through. 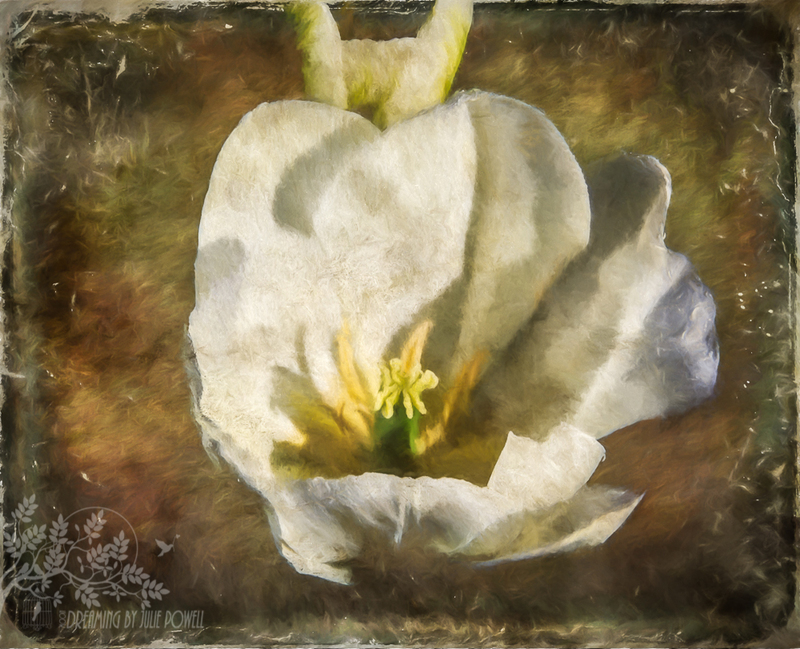 I played around with opacity and fill levels of the layers to get the look I wanted and finished up by adding a craquelure effect to the rose (filter-texture-craquelure) and poster edging to the fern (filter-artistic-poster edges), and adding a frame (filter-render-picture frame). In Color Efex Pro, I used the “foliage” filter to bump up the fern leaves and a bit of “glamour glow” to soften the craquelure effect that I decided was a bit too heavy handed. It could be that I went a bit overboard with all the effects, but I was having way too much fun to stop! 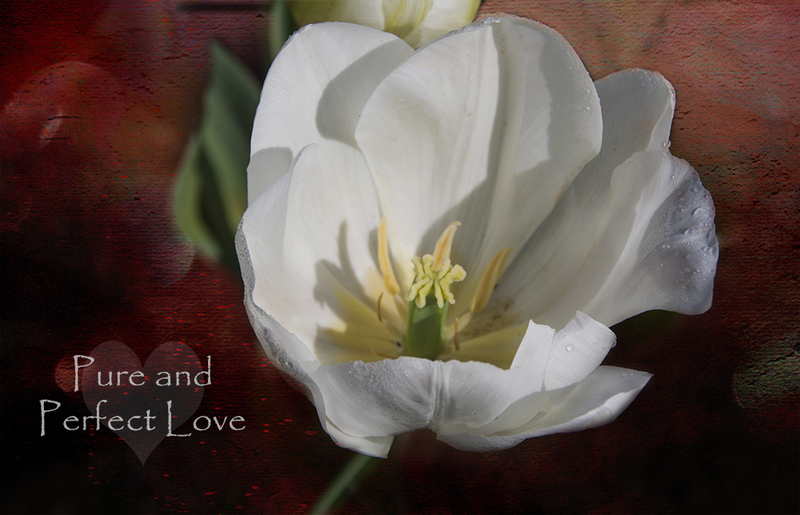 Thanks, Julie, for a wonderfully fun image for December’s 1PF! 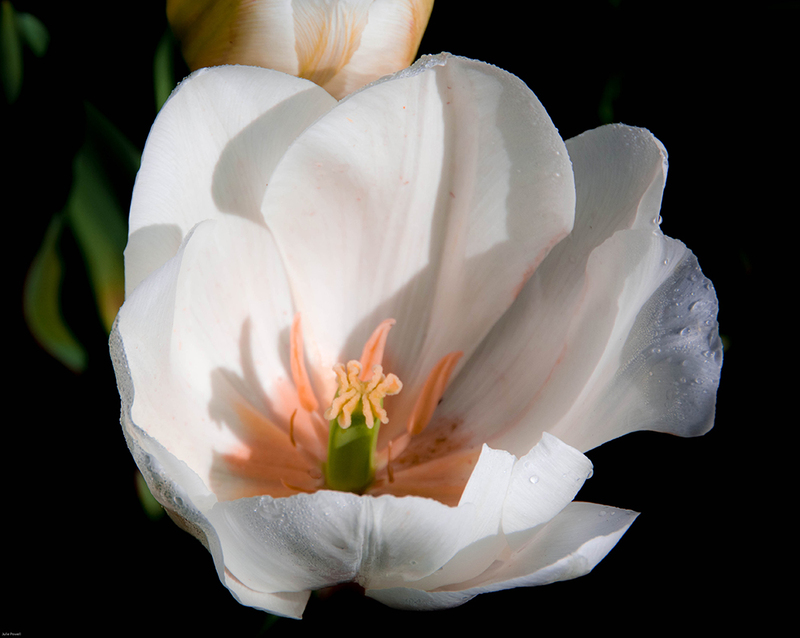 Cee says: I liked the small dew drop and the shadows inside the tulip. 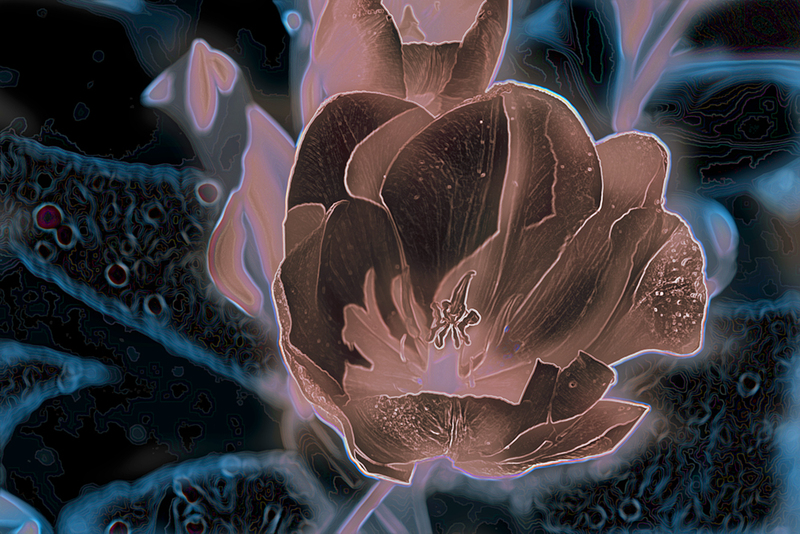 Since I really don’t change flowers often, I thought I would play around with the color a tad bit. 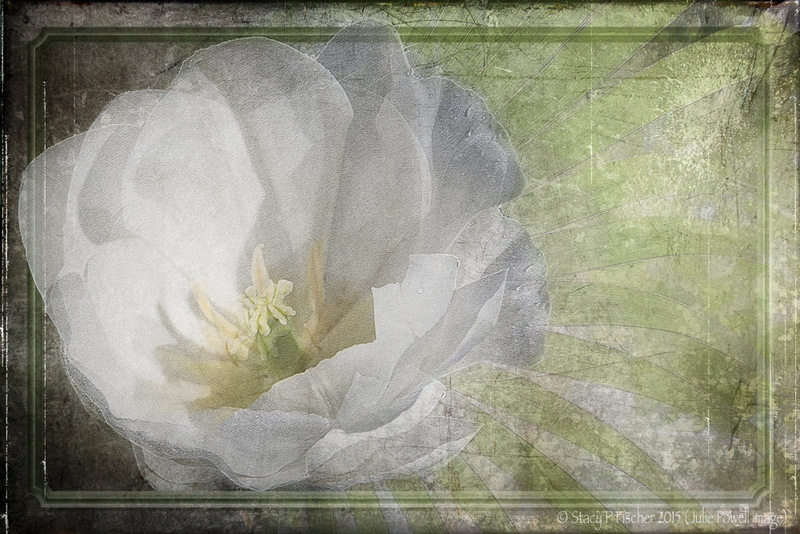 Sherry says: Using Julie Powel’s photo. I did a few adjustments in Lightroom, then in Photoshop I created duplicate layers and added directional blurs and masked out some parts. 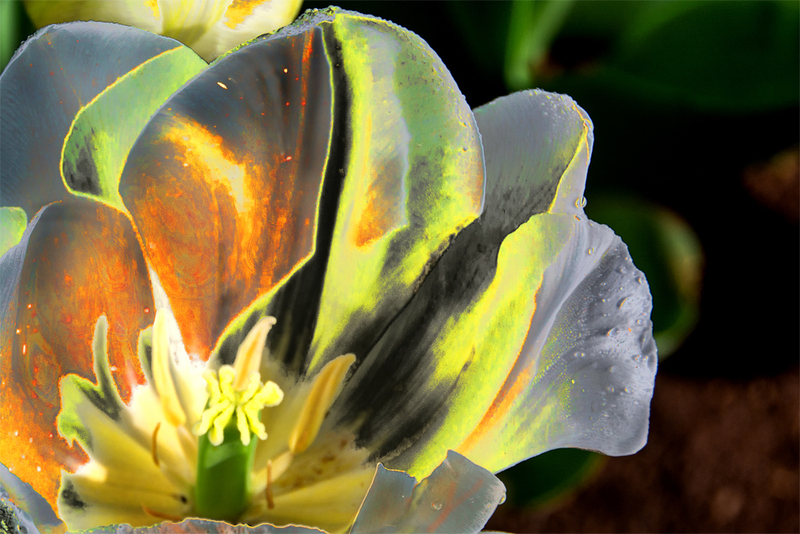 I enhanced the edges using filter – stylize – find edges. I also used adjustment layers. 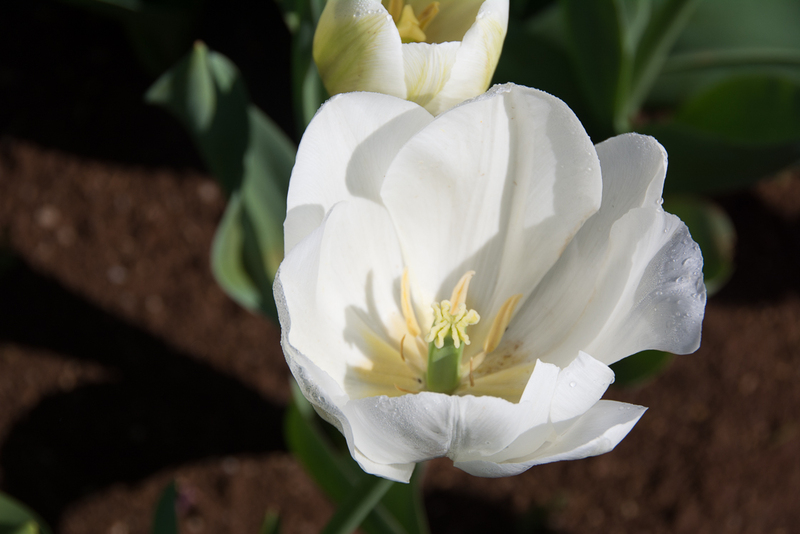 Chris says: Flowers are always a pleasure to work with and loaded with meaning. 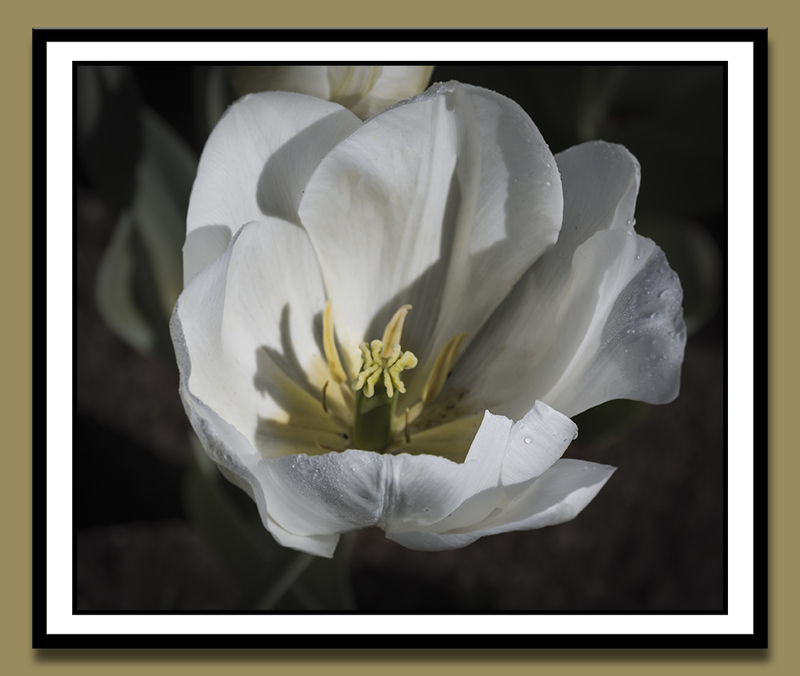 This was a nice opportunity to play with layers and masks to put my interpretation on this delicate tulip. Bren says: I decided to crop the image and do the whole processing this time in Photoshop. 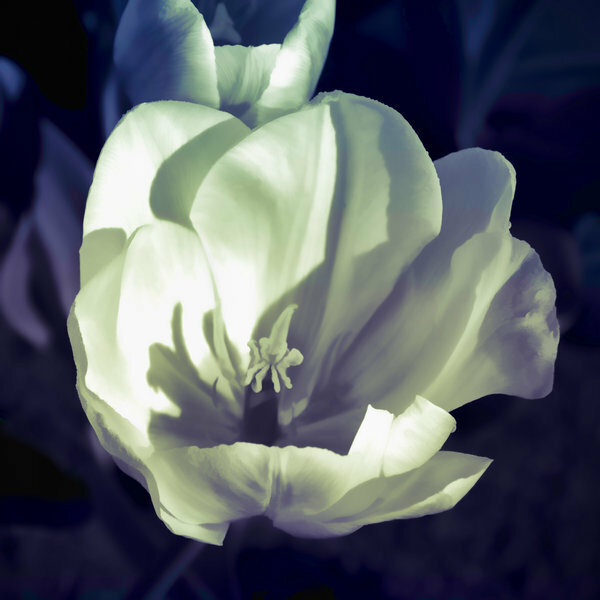 I added a texture, which I blurred and darkened in Camera Raw Filter… I then added a colour lookup to create the blue effect of the flower and then added some adjustment layers till I achieved the image I wanted. My post link is http://wp.me/p6HNfd-2Fj. 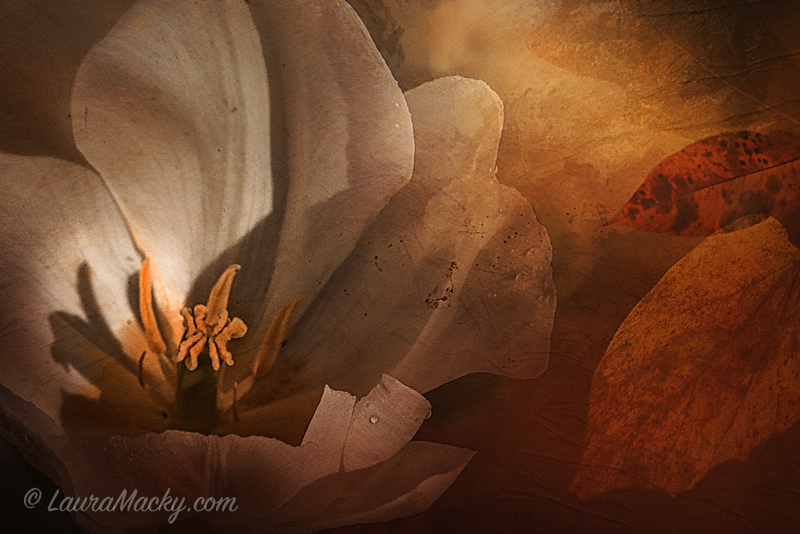 Raewyn says: I played around with different filters in both Photoshop and Nik Color Efex – and using layers as well. Not really my best but still learning. 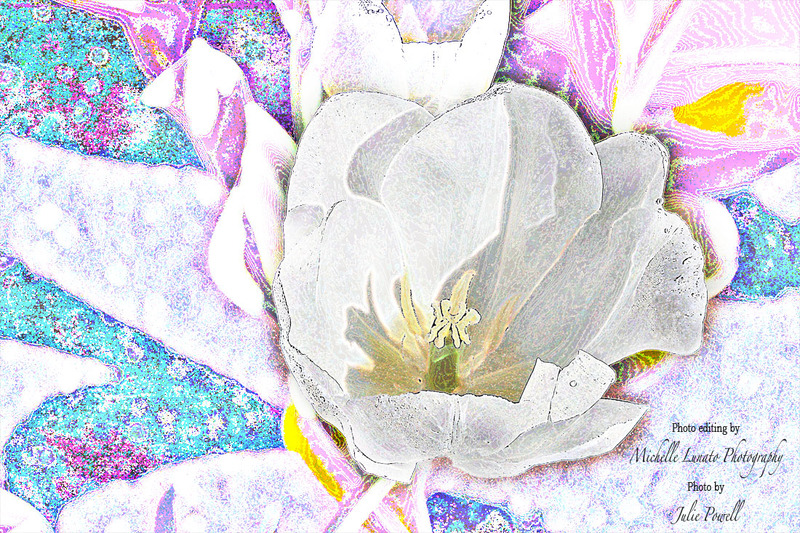 Helen says: First, I want to thank everyone who edited my photo in Nov. I have learned a lot, particularly in the areas of “texture”, “depth” and “color”. So I am stepping out of my box this month, trying to apply what I have learned in this month’s photo. Still have a lot to learn, but I am glad I have made my first step. I sharpened, cropped, and enhanced the light a little bit like usual. 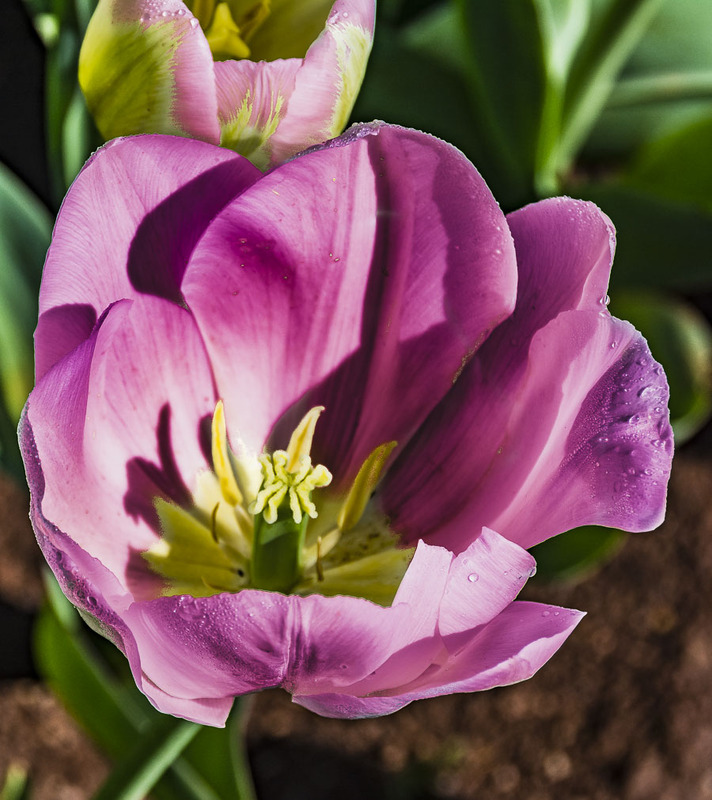 Then I played with “Hue and Saturation” using new adjustment layer. That’s about it… other than using brush, stamping… to do some final tuning. At first, I tried to write down each step, but soon I had so much fun that I had to keep going and forgot to write anything down. George says: I processed this in Lightroom CC, I blurred the background and also desaturated the background, then I sharpened the image and put it in my frame. 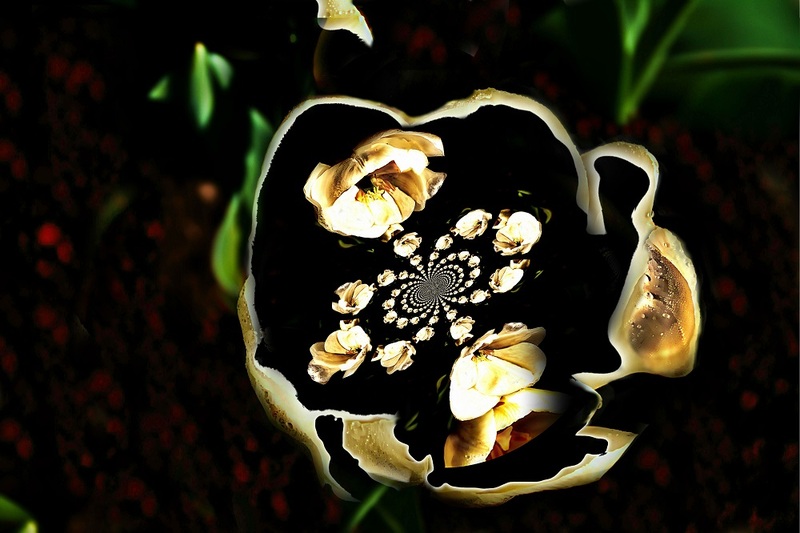 Natalie says: I love playing with flower photos and decided to make a composite image of the flower showing some details as well as the whole flower. Michelle says: I loved this shot of Julie’s! When I see her edits, I always think of art. Therefore, I tried to take her great photo and make it into something like a painting, or what I like to say, artsy:) Hopefully, I succeeded. Robin says: Many thanks to Stacy for continuing to manage the One Photo Focus, which is becoming a great way to kick off each new month. 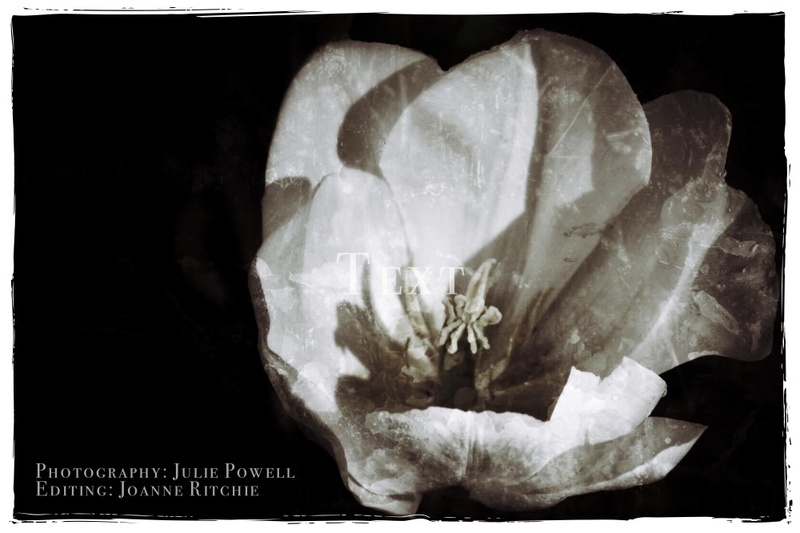 And special thanks to Julie Powell for contributing a truly interesting challenge for this month’s 1PF Challenge. I saw it as an opportunity to try some combined effects in Photoshop. 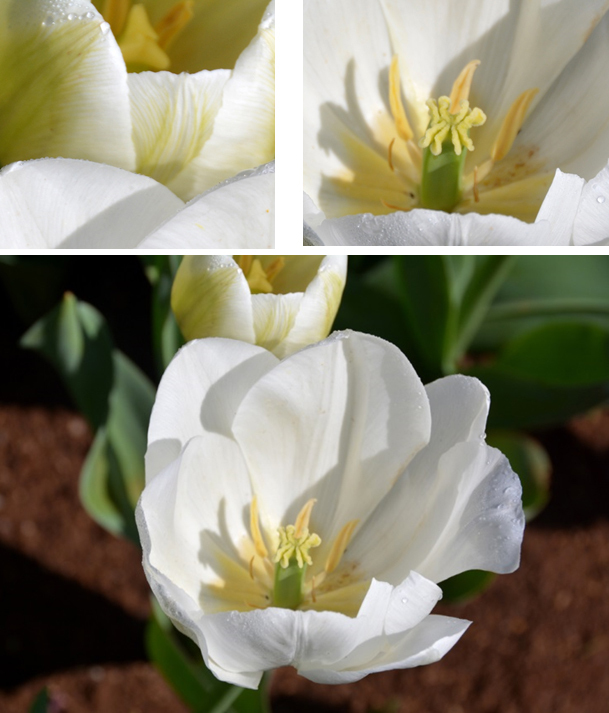 Briefly, I made three separate images each with a different effect: one was a curves adjustment layer using the color negative preset; the second was a “Neon Glow” filter from the Filter Gallery; and the third was a “Glowing Edges” filter also from the Filter Gallery. 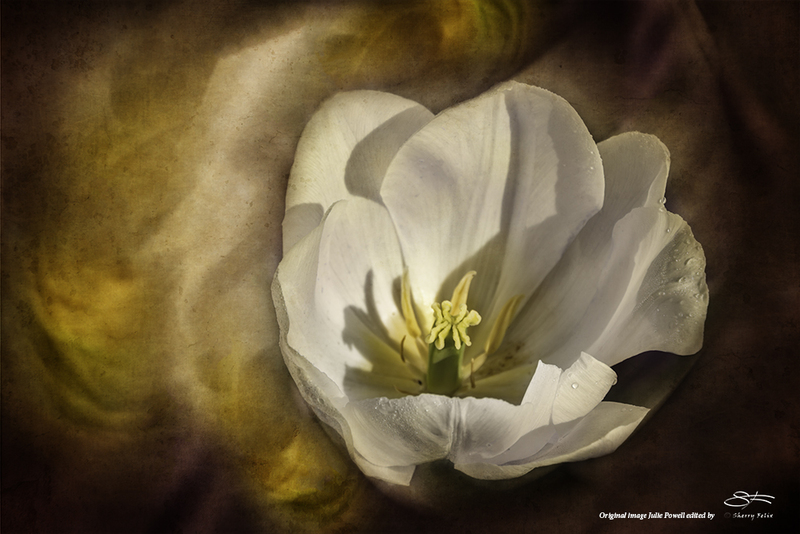 The three were stacked as separate layers, then using masks on each layer, I reduced the opacity of various sections in each layer to produce the overall effect. The final steps were a severe sharpening with the Unsharp Mask tool, flattening the layers, and an overall Hue/Saturation Adjustment Layer. Total Time: about 15 minutes. KK says: I can’t really remember what I did. This is not the only edit – there are about a dozen and this is a combination of at least 4. If you cruise by my blog – I’ll have the others posted and hopefully an explanation of what I did! 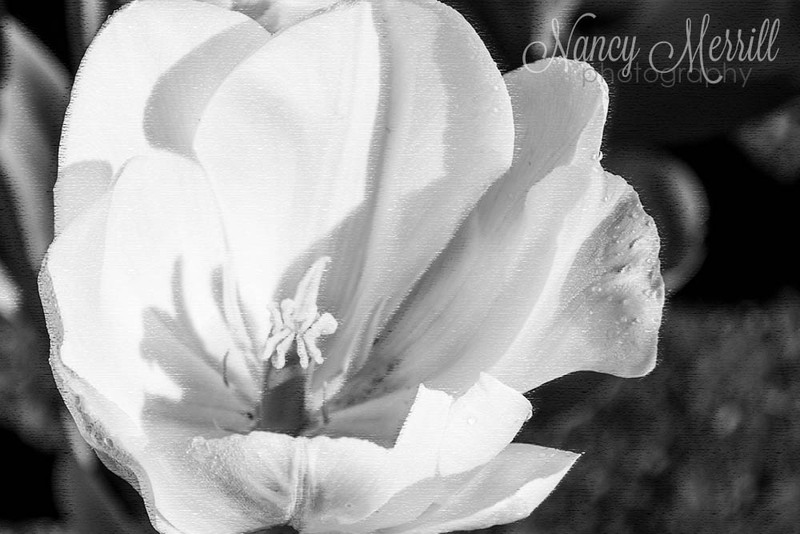 Nancy says: When I saw Julie’s image, I knew that I wanted to crop in close to the flower and go black & white. 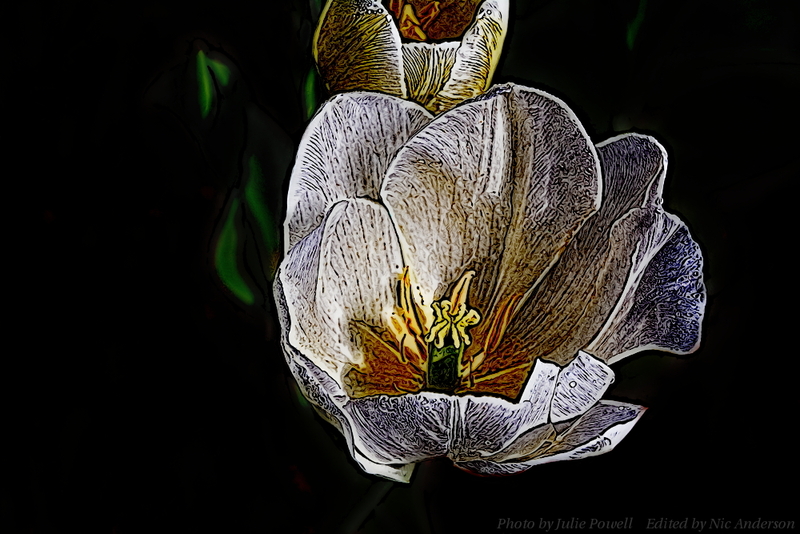 I used Photoshop’s Rough Pastels gallery filter to create the final image. Amy says: I used LR and added five filters through Nik Efex to come up with the final version. 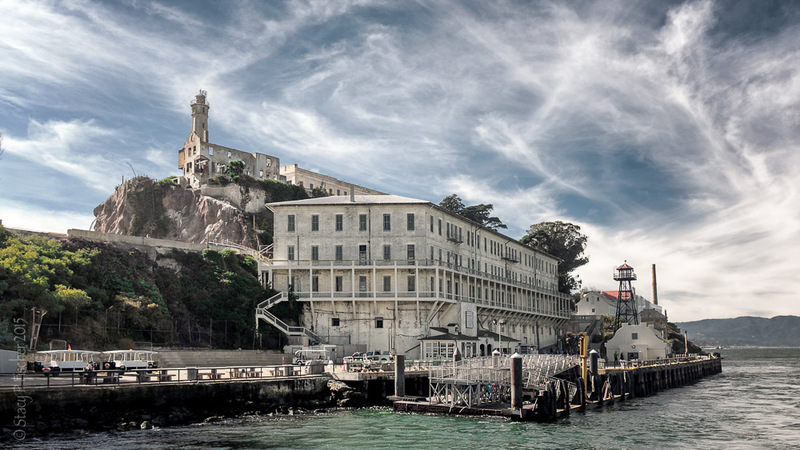 ← Alcatraz Island: Welcome to The Rock! I love the texture you add to the photo. The result is more like a painting. 🙂 Beautiful, Stacy! Sorry for the late reply, I thought I had commented on this last Friday… heh, it appears that I only glanced at it on my phone but didn’t get to my computer… oops. Great turn out this month! Lots of great interpretations. 🙂 I love that you had so much fun learning and playing with layers and filters, that’s the point, right? 🙂 Pasting and twisting the image twice is a neat idea I never thought of, but has a really cool effect. LOL, no apology necessary, Nic! As you can see, I’m just now responding to my last Friday posts and haven’t yet begun to make the rounds of everyone who participated. Time just seems to be in short measure these days! What a collection, each one so individual. I’m amazed at the creativity. I loved seeing all the different treatments collected together at the bottom of the post. This must be a huge undertaking for you, Stacy. I applaud your efforts in bringing so many photographers together, then sharing all the stories. Thanks, Alys 🙂 It does take some organization, but I’ve learned a few things as we’ve gone along. I have post templates that I copy and plug in each month’s information so I don’t have to start from scratch, and I have draft emails that I do the same thing with each month. It helps. But if I don’t keep up with submissions as they come in, well, then it can become a bit crazy. But I love it and am so grateful to all who participate, either by submitting or commenting. 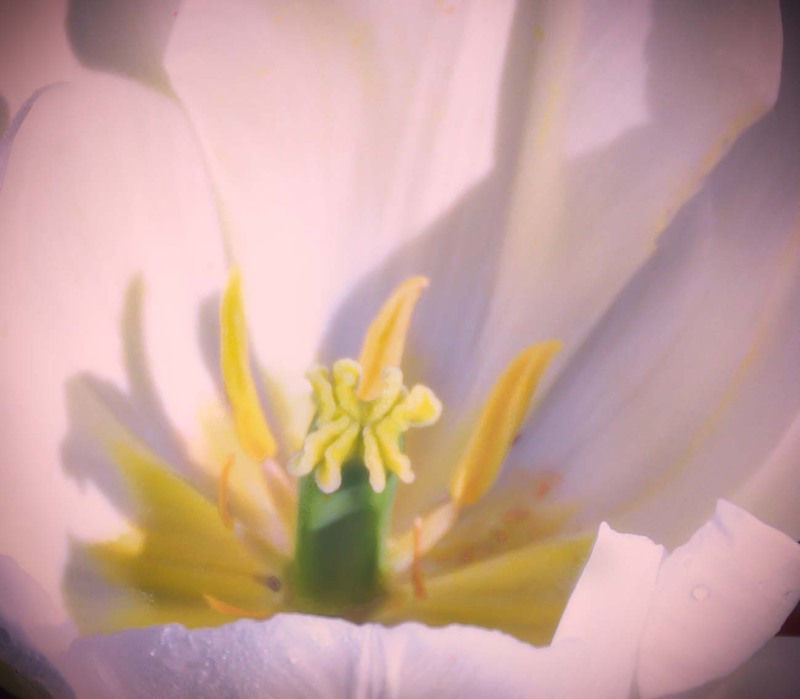 This challenge is amazing and I hope to join in sometime – and I love how u post each photo here for us to see – I came here from the “world is a book” and after seeing her one edit this was like a buffet! It is hard to pick a fav – but enjoyed scrolling – going to look again right now! Love the variety of interpretations. Yours is stunning Stacy. I particularly like your layers and the extension of the petals to the side as if the lines stretch into the background. Oooh, and I love how you describe it, Chris 🙂 Thanks so much. I really did have a lot of fun! Love your edit. It is interesting that there was a lot more artistic impressions than usual this time. These are really great edits! I think this one is the best one from everyone I’ve seen so far. Well done everyone! Laura, I forgot to tell you that there’s a comment on your image in the gallery. Yup, everyone sure had fun, Julz 😀 Thanks for inspiring another fun month of 1PF! Wow-so many cool edits! Love your fern touch Stacy. That was a nice touch indeed. 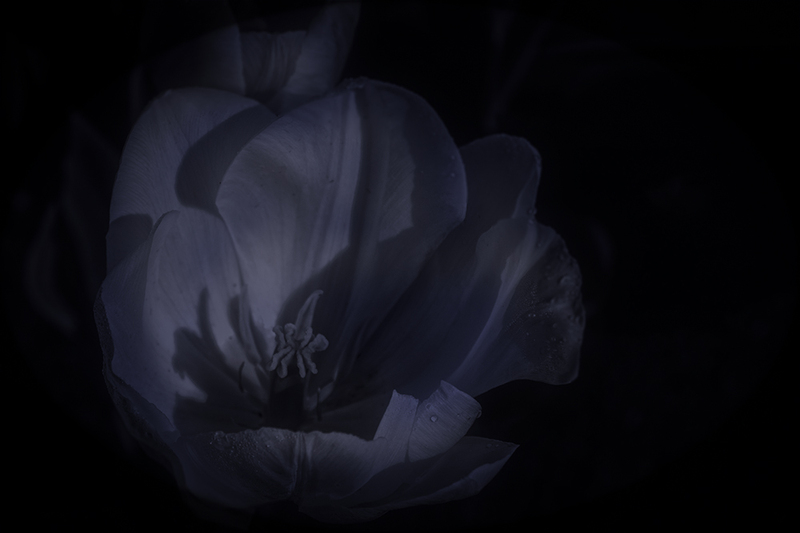 I am inspired to try merging some photos now. Lol, I hear you. I think that about my own edits at times.